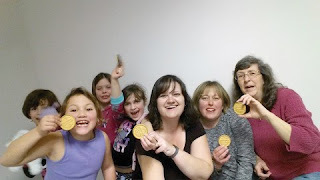 Girl Scout Troop 745 was fortunate to celebrate Girl Scouts 104th birthday on March 12, in a unique way. Laurel Parker, children’s librarian at the Windham Public Library, was the gracious host to four of the troop’s eight girls (Iyana, Ellie, Chloe, Leandra) and their leaders (Brenda and Kristen) for a sleepover at the library. The girls participated in some cool activities. 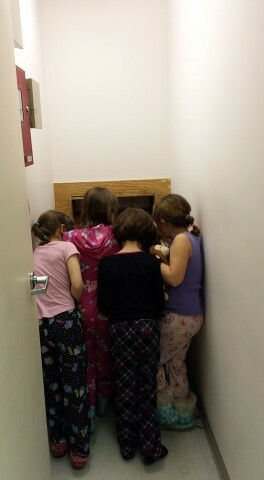 One of the highlights of the evening was a flashlight tour of the library, exploring spots you don’t typically get to see, such as the book drop. A surprise was encountered at the book drop, something Mrs. Parker said in all the sleepovers she’s hosted at the library she’s never had happen – someone was dropping off their books as the girls were peering into the drop box. Imagine the gentleman’s surprise on the other side of the flap! 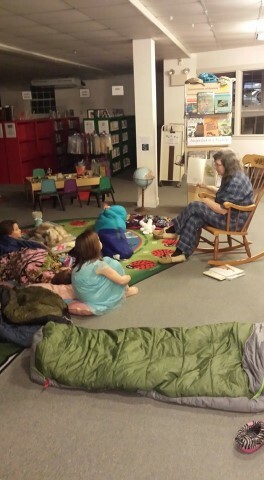 Troop 745 enjoyed their adventure at the library with Mrs. Parker and appreciated the opportunity!